Keep your tools close at hand. This nail apron is made with heavyweight firm-hand duck, the most durable canvas out there. It has four large pockets to hold your nails, screws, and small hand tools, plus there are two utility loops on the strap. It is great... she wears it for work to hold some different things!!! 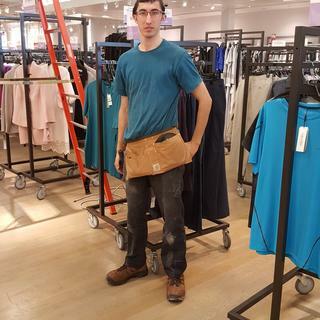 This is a product review of the Carhartt Nail Apron (CNA), style #A09, done between 11/4/2018 and 12/30/2018. I received the CNA in new condition in a 2XL size. The strap is adjustable and easily altered for a good fit. The CNA is 100% cotton (exclusive of trimming) and washable. 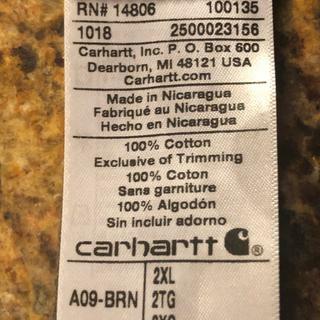 The CNA is made in Nicaragua and shown on the product tag. On the front of the CNA, in the lower center is the Carhartt emblem. The waist strap also has a hammer loop on both sides of the apron. Overall the CNA appeared to be very well designed and practical. I utilized the CNA in a conventional way as well as unconventional. The conventional way, well it is a nail apron, so I used it as a nail apron. It held nails with no problems. I worked on building/repairing/updating two shoot houses on my property. Both are approx. 12-14 feet off the ground and climbing a ladder with the items necessary for my work was made easier with the CNA. I also tried using it to carry screws for another project, up a ladder. However, it was problematic due to not having the ability to hold my cordless drill and climb a ladder safely. There may be a way to alter the hammer loops and hang a cordless drill from the loop in the future. Overall the material held up well and there were no punctures through the material. Now to a few unconventional ideas to utilize the CNA. First, I utilized it to hold my knives when I skinned and processed a deer. When skinning a deer, I utilize several knives (field dressing, skinning, deboning, etc.). I do not like to use the same knife throughout processing the venison due to contamination. The CNA made it easy as the 4 pockets were able to store the individual knives separately without contacting the other knives and made them readily accessible throughout the entire process. The loops were utilized to carry an extra set of rubber gloves on one side and a towel on the opposite side. After completing the processing, just put the CNA in the washer. The next unconventional idea, holding dog treats when training my dogs. Utilizing a positive reinforcement method, to introduce dogs to new positions, and rewarding with a food treat is easily done with the CNA. I was able to hang the dog leads through the hammer loops, thus freeing up my hands for praising the dogs and rewarding them with food treats carried inside the nail compartments. I know this is a “Nail Apron” and those reading reviews want to know how it held up under those conditions. However, this day of tight budgets (retirement), finding an item that can serve multi-task is important to me (and like-minded frugal people). Therefore, I believe the CNA serves the purpose as a nail apron sufficiently but, more importantly, it is a multifaceted item that is capable to serve many other needs as well. I’ve been using these in the field for 21+ years, and I’ll use the them for 21 more. Use to wear the carhartt coverall all the time but switched to just the pants and really missed having the extra pockets of the nail apron attached to the coveralls. This thing is great. Easy to put on and I have the convenient extra pockets for all my stuff at work in nice light little belt. The only downside is they can to slide down sometimes, a little annoying but overall o would recommend this product. apron needs to be taller more room between pockets and waist band. This apron needs to be taller meaning more room between waist and the first pockets. Carpenter for 40 yrs..
We have contacted the customer and shared this review with our Product Design department. 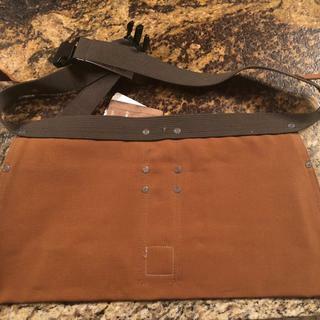 If you are someone that does not have to wear tool bags for your trade this apron is perfect! I use it to carry nails, screws, etc & small hand tools. It is light weight, adjustable, extremely durable and very convenient. I love these things! I’m buying my third one. I usually get 5 to 6 years out of them before the buckle breaks. use everyday on our jobsite. the smaller pocket never has ripped through into the big pocket. it is made very well and i can not complain! Tough, durable, practical. All three great traits and hallmarks of the Carhartt brand. This apron has many uses. I actually bought this to use as an apron to hold photography gear while shooting in locations that require me to have smaller items like filters, polarizers, a light meter, etc. handy. In that respect, it has worked out great!I havent had this long, so I cant rate it in terms of durability, but I expect it will be as durable as other Carhartt products. Interior systems carpenter here, and I find this Carhartt apron practical inside a hospital setting. 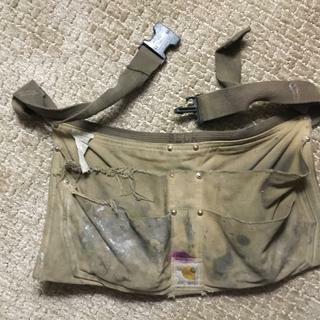 Wonderful tool belt made of quality materials. The buckle is sturdy and easy to use, which makes for a great functional touch. Got this for my brother and he loved it. It was very nice, very good quality. I bought it as gift for my grand daughters boyfriend. I'm excited to give to him. Owned 2 of these nail aprons and the first lasted many years. The 2nd one didn't last 3 months as the plastic clasp broke. Great heavy duty nail apron but plastic parts are flimsy and cheap. Very sturdy duck cloth and four pockets, what a pleasure. Would recommend ,great for several trades ! While the product (brand and quality) is superior to anything else on the market, the purchase wasn't quite what I expected, or wanted, just based from the picture. This is only from a personal function and design use only. I can't imagine working without it! I was introduced to these aprons by my mentor. They are great for carrying anything that you need quick access to. I would, and have, recommended these aprons because they are strong and durable. Easy to clean too. Good price for a great product! I have put my utility knife in one of the pockets and it has poked a hole in it. I think there should be a liner of some sort on the front two pockets to protect them from this. I'm a handyman and like to keep some basic materials and tools handy. The apron is very well made with durable cloth but has a major flaw. The pencil-pockets should be at the sides so when bending over the pencil or nail-punch does not stab you in the guts. Carhartt has contacted the customer and shared the feedback with our Product Design Team. Just what I needed. I love it makes my job a lot faster ! I like the design, fabric and construction quality. The down side is the belt snap feature. It broke after a short time of use. Would return it but no longer have the sales receipt. Upgrade that and you have a quality product. I love my Carhart apron!!! I just wish the front pockets had vertical pockets for tools ... Most of the time they'll lay horizontal and have a hard time digging them out. Example: 9" diagnal side cutters. Thank you. Hope to see a new product soon. Good product but broken belt buckle. A friend had one on the job site. I had always used just cheap canvas nail pouches from national chains. I bought one and the next time I saw my friend he had broken his belt buckle. He was back to using the cheapy. He warned me that the buckle cant take the harsh environment of electrical work, he might be correct. My buckle lasted another two weeks and it has broken also. Definite design flaw other than that the belt, and pouches are alright in my book with one exception, THE BUCKLE is a weak link! I bought this apron to use at work to hold my tools and it works great. I like how they came out with a black apron. This is a great looking and feeling apron, I've had several over the years. However recently I have gotten less and less use out of each apron. The stitching breaks where I put in my screw driver. I think it would be wise for them to use tripple stitcing on the aprons, as it stands now the pockets only have a double stitch. I am a Master Electrician and I use my Carhartt nail apron every day to hold my hand tools,(linesman pliers, wire strippers, screwdrivers, ect. ), as well as parts I need for various tasks, such as wirenuts, screws, conduit fittings, ect. 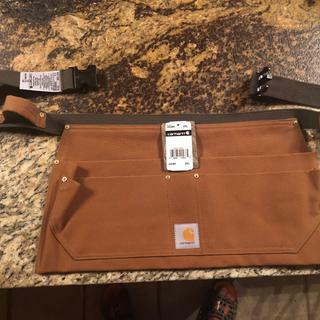 It is very durable and the wide belt is much more comfortable than those cheap string nail aprons you get from the major home improvement suppliers. I would definitely recommend this product to anyone in the construction industry. I bought this as a gift and the person i bought it for said it was the best belt he has ever had. he used it all weekend. It's the best work apron I've ever used. GREAT!!!!!! THAT'S ALL I GOT TO SAY!!!! I have been a electrician for years and always wore the small light weight nail aprons you get at the local lumber yard. To carry the small parts and things we need for the trade. The wear out or rip in a week or so, sometime only days. But this apron is the best thing since sliced bread. It holds more, it carries better and is more comfortable and durable than any I ever saw. Every tradesman should have one. I work as an electrician and I need to carry the little things to get the job done. That means I carry many different screws, nuts, wire nuts, and other small tools in a nail pouch. I was using cheep nail bags bought at hardware stores that lasted weeks at best. Sometimes I would buy a new apron and it would not make it through the day! The threads would pull out and I would have a pocket with all the parts combined. A co-worker had a Carhartt apron ad I checked it out. He said he had it for 3 years! So I knew where I was getting mine from. I had mine for only a few weeks but I have found my nail apron for the future! If you work like me, buy it! You won't regret it! I think its great the Carhartt has produced an apron. I use it all the time from simple repairs around the house to building cabinets, along with finish carpentryprojects. I dont expect any thing else but satisfaction from Carhartt. 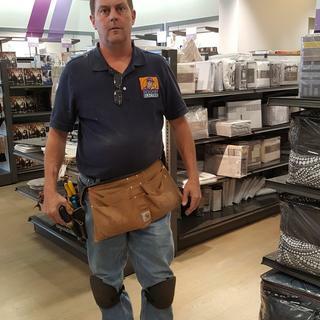 I am an electrician for I.B.E.W local 26 out of washington D.C. and for starters i can't say enough good about this tool apron's convenience , comfortability, its very large item capacity, you name it there is a pouch for it ! Now i could go on and on about its greatness but i wont its an apron one that i happen to love , you see i tote my side cutters ,screw drivers ,channel pliers ,etc. but i've gone through numerous aprons because of one small thing ! At the very bottom of the apron small holes start to form that eventually turn into large holes after about a month or so ,and i sew them back together with steel tie wire, due to there slim availability in retail stores i hold on to them as long as i can. now for the sollution , maybe just a reinforced bottom edge like you do on the knees of alot of your jeans and this little sachel is at the forefront of apron enginuity at its finest! Keep up the good work and lets get that into production and on the shelves a.s.a.p.! JUST KIDDING ABOUT THE ASAP THING! but really lets do it! what are the dimensions of the canvas portion of this belt? BEST ANSWER: The bottom edge is about 19" wide. The height is about 9." Are there replacement clips available for the belt part? I don't understand why these aprons are gendered. I am a woman who would like this product in black. Would you ever offer it in a size small? Looking for a full size men bib style work apron do you carry this item? Is there a rectangle loop available for a tape measure? BEST ANSWER: This style does not have any loops for a tape measure, however a tape measure would fit in one of the pockets.